Mr. Inosanto is one of the world’s greatest and most talented martial artists. He is a student of many wonderful and accomplished instructors such as the Legendary Bruce Lee, the Great Edgar Sulite for Lameco Eskrima and the Talented Grandmaster Surachai Sirisute for Thai Boxing. 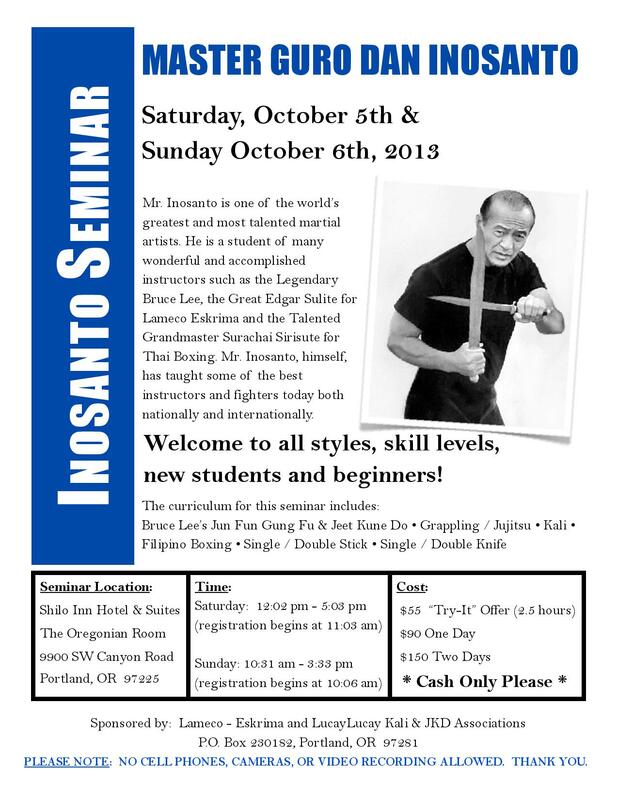 Mr. Inosanto, himself, has taught some of the best instructors and fighters today both nationally and internationally. Welcome to all styles, skill levels,… new students and beginners! PLEASE NOTE: NO CELL PHONES, CAMERAS, OR VIDEO RECORDING ALLOWED. THANK YOU.